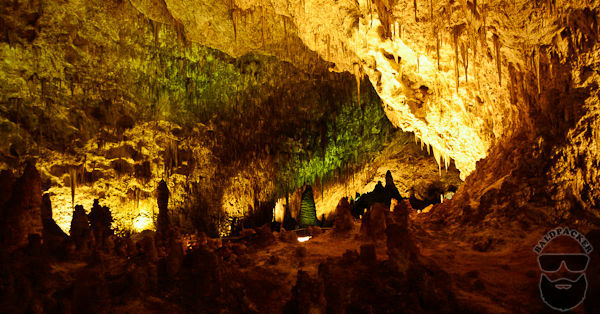 Carlsbad Caverns National Park, in the southeast of New Mexico, contains over 119 caves. 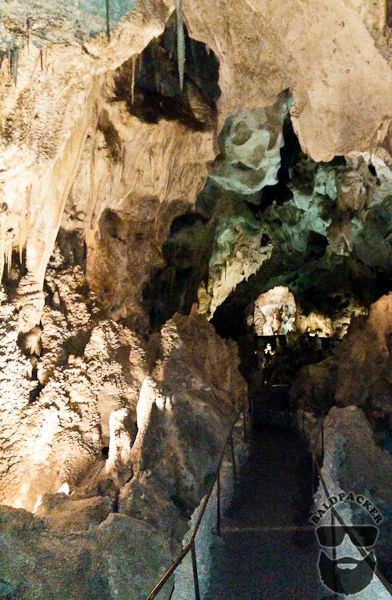 Three caves are open to public tours run by the National Park Service with Carlsbad Caverns being the most famous and developed with electric lights, paved trails, and elevators. Slaughter Canyon Cave and Spider Cave are undeveloped but accessible on designated paths for the guided “adventure” caving tours; more information on the Ranger Guided Tours can be found on the National Park Service website. 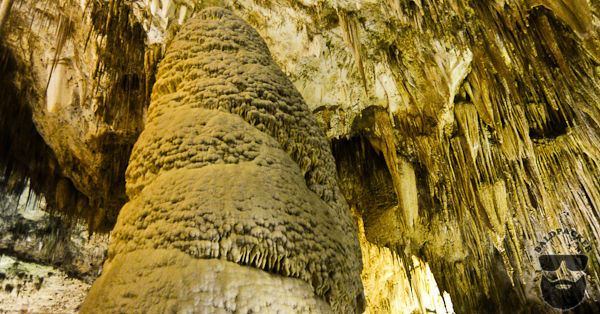 Carlsbad Cavern, accessible on self-guided tours, includes a large cave chamber called the Big Room. The Big Room is a natural limestone chamber that is almost 4,000 feet (1,220 m) long, 625 feet (191 m) wide, and 255 feet (78 m) high at the highest point. It is the fifth largest chamber in North America and the twenty-eighth largest in the world (the largest is in Sarawak, Malaysia). 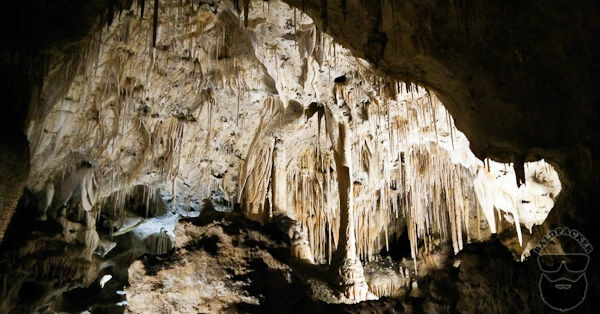 An estimated 250 million years ago, during the Permian Era, the area surrounding Carlsbad Caverns National Park served as the coastline for an inland sea known as the Permian Basin. Present in the sea was a plethora of marine life, whose remains formed a reef called the Capitan Reef. Unlike modern reef growths, the Permian reef contained bryozoans, sponges, and other microorganisms. After the Permian Period, most of the water evaporated and the reef was buried by sediments. Tectonic movement occurred during the late Cenozoic, uplifting the reef above ground creating mountains, including the Guadalupe Mountains. 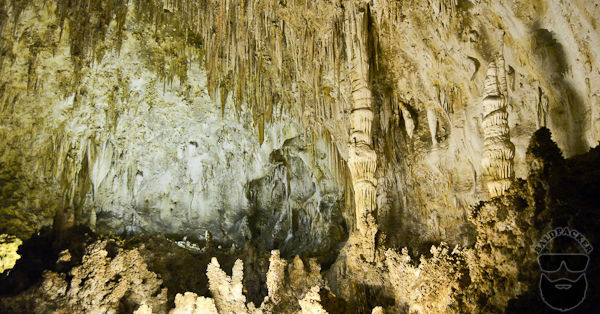 After the caves were formed, erosion above ground created the natural entrance to the Carlsbad Caverns within the last million years. 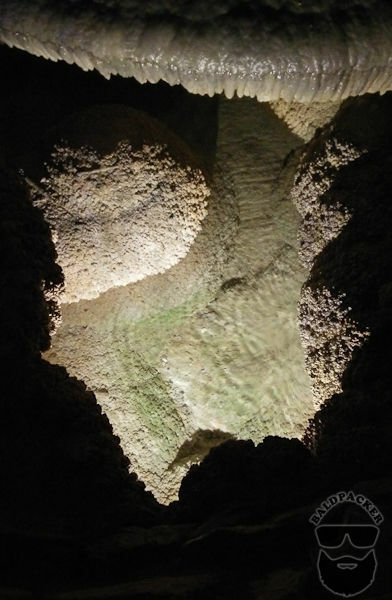 Exposure and proximity of the caves to the surface allowed rainwater and snowmelt to percolate downward into the ground, picking up carbon dioxide along the way. 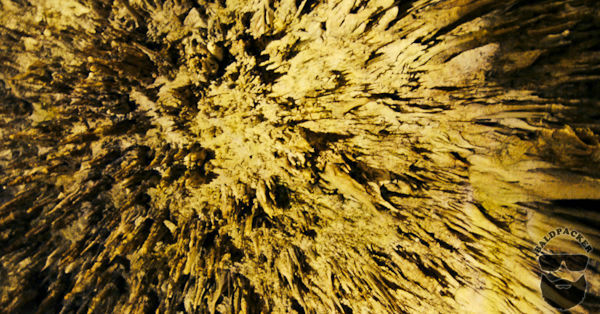 Once this water reaches a cavern ceiling, it precipitates and evaporates, leaving behind calcium carbonate deposits called speleothems. Growths from the roof downward formed through this process are known as stalactites. 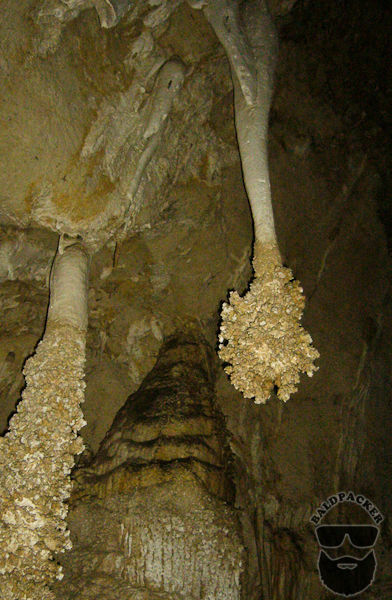 Growths from the floor upward through this process are known as stalagmites. 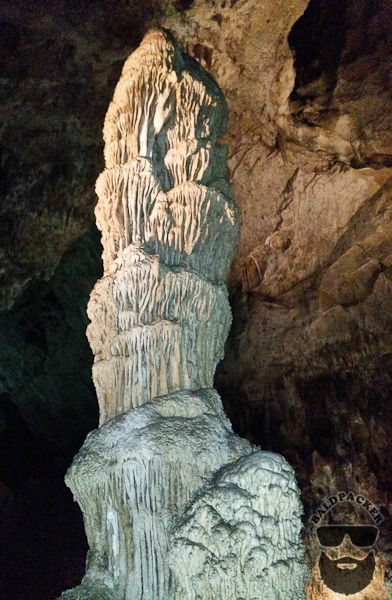 Different formations of speleothems include columns, soda straws, draperies, helictites, and popcorn, which are all easily visible within the Carlsbad Caverns. 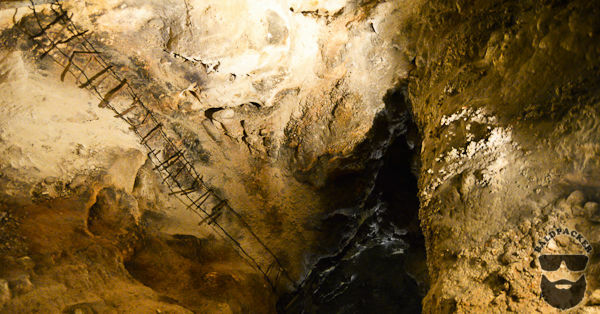 A young boy named Jim White explored the caverns with his homemade wire ladder in the late 1800s. An inscription reading “J White 1898” was discovered deep within Carlsbad Caverns in the 1980s showing that White had explored them as a 15 or 16-year-old boy. White named many of the rooms, including the Big Room, New Mexico Room, Kings Palace, Queens Chamber, Papoose Room, and Green Lake Room. He also named many of the cave’s more prominent formations, such as the Totem Pole, Witch’s Finger, Giant Dome, Bottomless Pit, Fairyland, Iceberg Rock, Temple of the Sun, and Rock of Ages. Although White is the cowboy credited with being the premier explorer of Carlsbad Cavern, in 2003 a park employee found a piece of a stone scraper within view of Carlsbad Cavern’s entrance that goes back to Ice Age Native American hunters. In 2004, archeologists found fragments of two spear points of the Midland-style Paleo Indian projectile points of some 10,000 years ago meaning Native Americans very likely used the Carlsbad Caves for shelters many millennia ago. 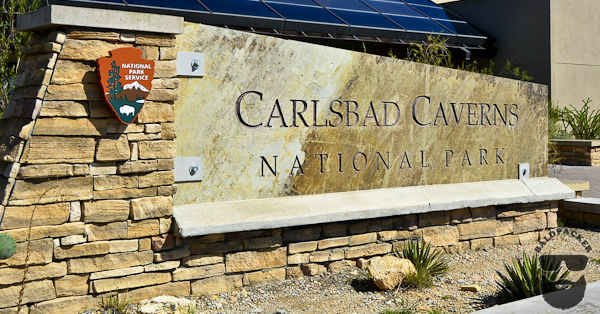 In 1923, President Calvin Coolidge established the Carlsbad Cave National Monument, which was then ratified as a National Park by Congress in 1930. Until 1932, visitors to the cavern had to walk down a switch back ramp-sidewalk that took them 750 feet (230 m) below the surface. The walk back up was tiring for a lot of visitors so in 1932, the National Park opened up a large visitor center building that contained two elevators that would take visitors to the caverns below. 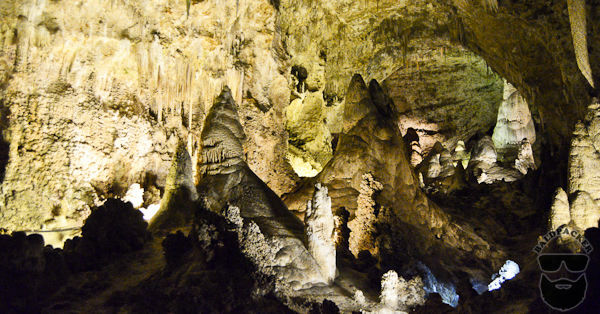 Now it is possible to both walk or take the elevator up and down into the Carlsbad Cavern. There is no front-country camping in Carlsbad Caverns National Park so our group visited the Carlsbad Caves after a weekend camping in Guadalupe Mountains National Park. There are free backcountry camping permits available in Carlsbad National Park if your heart is set on camping in Carlsbad, though Guadalupe’s Pine Springs Campground is only 45 minutes away. At the junction of National Parks Highway 180 and Carlsbad Caverns Highway 7, is Whites City, a small town with basic facilities, RV Park, and population of 7 people according to the census. 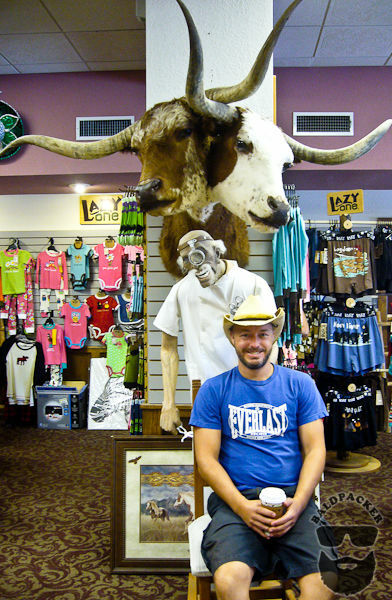 We quickly stopped to check out the over-the-top tourist shop, fuel up on coffee, and take photos of the strange and unique displays including stuffed rattlesnakes, two-headed longhorn cow, and funky stools. The gift shop was quite expensive but if you’re in the market for souvenirs, they stocked everything and anything I could imagine. 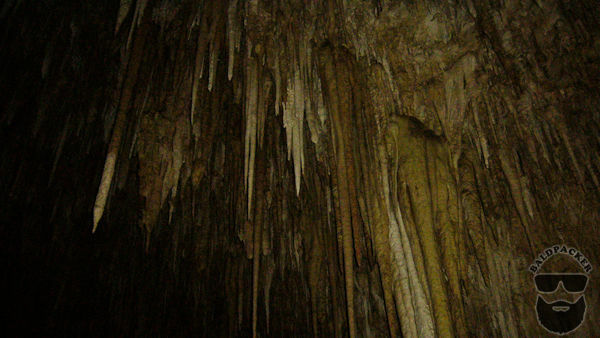 At the Carlsbad Caverns Park office, our group paid the fees for a self-guided tour of the Big Room. The General Admission charge is $10 per person, though Sara and I put our $80 Annual Access Pass to use and covered the fees for four of us. If you plan to visit a lot of US National Parks, the $80 Annual Pass is a bargain; I’m sure we’ve covered our cost in only a few weeks of having it. There are two ways to get to the Big Room Trail, by elevator or the steep Natural Entrance Trail, which is a steep 1¼-mile (2 km) descent. Although Sara and I would have loved to do the one hour walk down the Natural Entrance Trail, some people in our group thought the one to two hours required for the 1¼-mile (2 km) Big Room Trail was enough time underground so our group took the elevator both down and up. 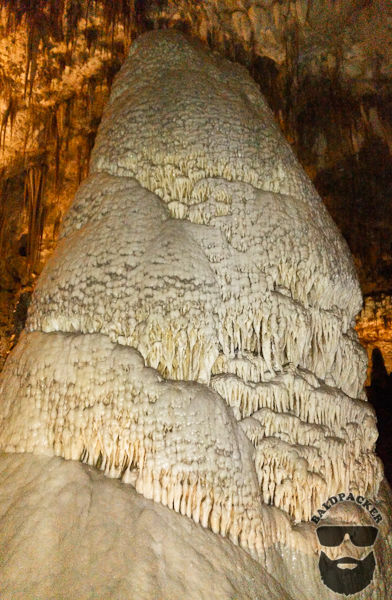 In reality, one to two hours in the Carlsbad Cavern is probably enough, though every cave and speleothem is unique so if you love being underground then you could easily spend half a day wandering around naming all of the unique speleothem shapes. 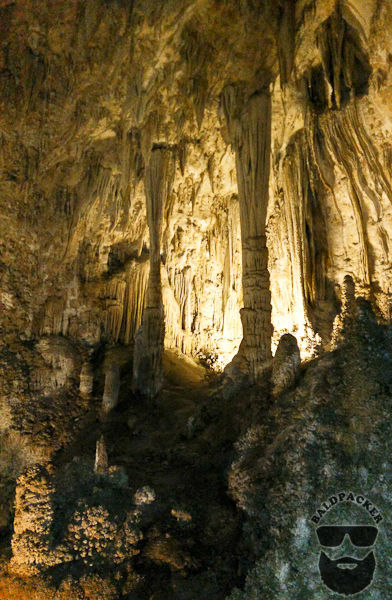 Overall, I really enjoyed exploring the Carlsbad Cavern and would love to return to explore the less-traveled caves or walk the Natural Entrance Trail. 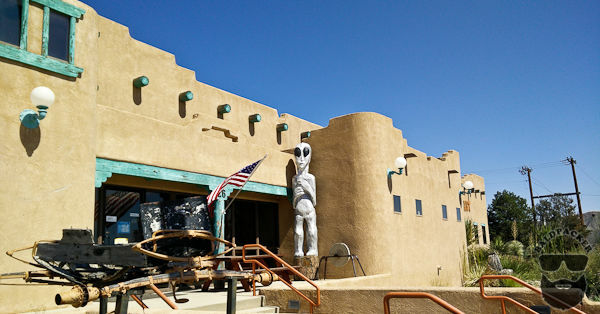 I expect visiting the caves on a hot and sunny New Mexico summer day would be especially refreshing given the cool temperature underground. 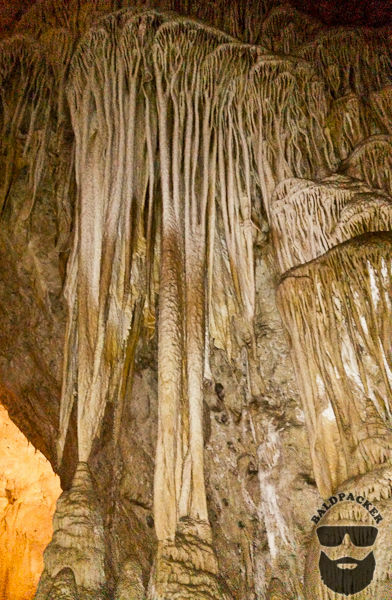 A visit to the caves would be the perfect compliment to a hike in the nearby Guadalupe Mountains, so if you’re interested in combing the two, read my post about camping and hiking in Guadalupe Mountains National Park for more info.